Famous talk show host Eric Parker is coming to Sweet Valley for a special episode of his show. 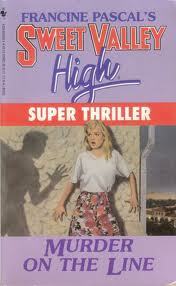 He’s selecting one teen from Sweet Valley High, his alma mater, to interview on his show. Jessica is convinced this is her chance at fame and stardom, and she’s determined to get the guest spot on his show. All interested students have to fill out an application proving how all-American and well-rounded they are. Jessica angsts about her application, because in her mind, her only real competition is Lila Fowler. Lila seems to be fudging the truth on her application, but perhaps her most egregious lie is that she leaves off exactly how wealthy she is. This infuriates Jessica, who is working hard to create an application that is truthful and representative of who she is. She decides she needs something a bit more academic for her application, so she writes a feature for The Oracle about the worst dates she’s ever had. Penny loves it and promises to print it in the paper’s next edition. 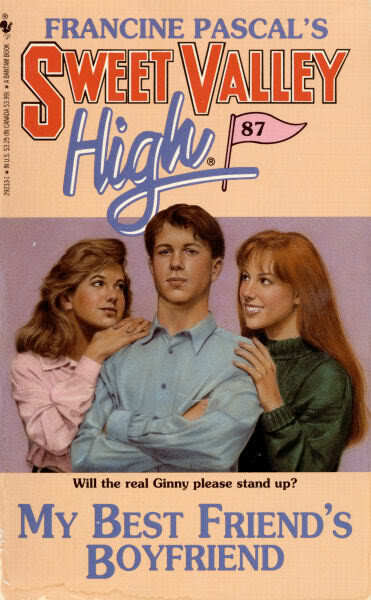 Turns out that the applications from Sweet Valley High were so good that Eric needs more time to narrow down his choices. He selects some students for interviews, including Jessica and Lila, whose rivalry for the spot is so intense at this point that they aren’t speaking to one another. Lila tries to sabotage Jessica’s interview by removing the note that tells candidates the interview room has been moved, and Jessica tries to sabotage Lila for that prank by casually mentioning that Lila’s father practically owns Sweet Valley. All this is for naught, though: Jessica ends up winning the spot on Eric Parker’s show, and Lila is the alternate choice in case Jessica can’t make it. Jessica is elated; Lila is furious. She devises a plan–with the help of Bruce Patman, who’s pissed about Jessica referring to his kissing abilities being like a jellyfish–to keep Jessica from being at the school on time for her taping. Lila convinces Jessica to go shopping with her for a new outfit before the taping. They do this on the same afternoon as the interview, and Lila convinces her to drive a ways up the coast. Once there, Lila ditches Jessica while she’s in the dressing room, and Bruce Patman calls the store and pretends to be a detective, warning the store owner of a shoplifter fitting Jessica’s description. 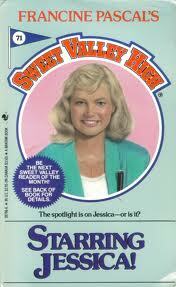 Jessica is detained, Lila goes back to Sweet Valley, and all is lost. Only, when Jessica calls home, Elizabeth comes up with a plan. Stepping in as Jessica for the interview, she nails it, allowing Jessica to have her glory and Lila to get locked in the dressing room closet. Elizabeth saves the day! The B-plot features Elizabeth worrying that her interests are too focused on the literary. She decides to become a volunteer junior park ranger at Secca Lake. She and Enid attend some classes, take a quiz, and then Liz is appointed the Chief Junior ranger. Only she starts to feel overextended, and then finally realizes that you can be passionate about a lot of things, but being dedicated to them all is exhausting. So she gives it up to focus on her writing. Winston refers to the time he and Jessica were shipwrecked on Outermost Island–was that what it was called? Jessica mentions that Bruce Patman kisses like a dead jellyfish in this book, but it’s mentioned as something that happened in the past in the previous book (Enid’s Story). Continuity is hard, guys. There isn’t much to snark on here, really. Apart from the awkwardly shoe-horned in lessons about the environment and the importance of conservation, this is a fairly straight-forward plot. I do find it weird that everyone is so obsessed with Eric Parker’s talk show, because it doesn’t seem like something that would actually appeal to teens at all–from what little we know of it. Also, the Lila-Bruce kiss thing: I didn’t mention this in my recap, but they kiss each other passionately after congratulating one another on their devious plan to sabotage Jessica goes off without a hitch. It’s a weird moment–and it feels so disingenuous to the characters that I found it jarring. I know it was meant to serve as a way for Lila to yell at him later about kissing like a dead jellyfish, but it still rankled me. Up next: SVH #72: Rock Star’s Girl.